Like countless other creatives, designer Julien Dossena spent his teenage years in awe of Peter Saville. With his record sleeve designs for Factory Records and bands like New Order, Saville changed the visual culture of the 80s. Since his long-term collaboration with Yohji Yamamoto, the art director’s provocative and thoughtful work has served to inspire subsequent generations, from Raf Simons to Kanye West. 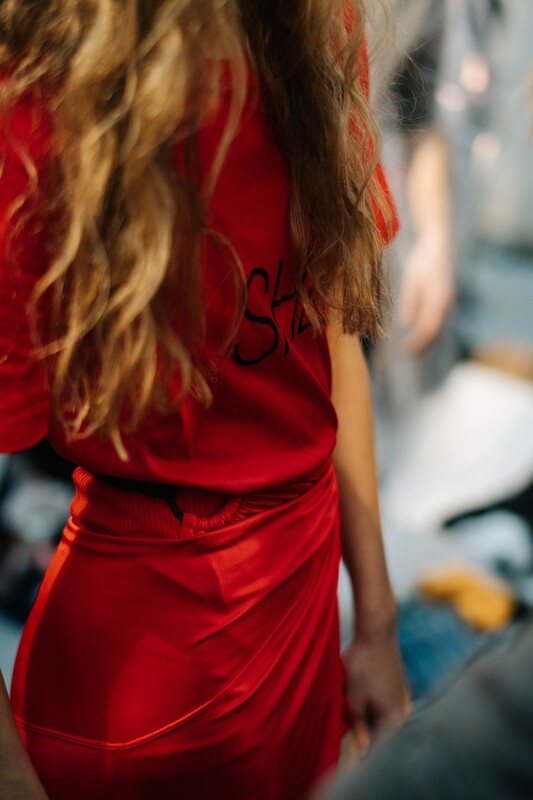 This season sees his second time working with Dossena, whose vision has brought Paco Rabanne into the crisp light of contemporaneity. Backstage after the S/S18 show, Saville points across the room. “There’s Marc Ascoli, the man who introduced me to doing fashion with Yohji in 1986... he’s talking to Julien who, two generations later, is asking me to do things.” Saville is visibly invigorated by this ever-turning wheel of ideas as he gesticulates in circular motions. So too is Dossena it seems, who has also previously enlisted Ascoli’s art direction (whose 90s campaigns for Jil Sander are still referenced today) for Paco Rabanne’s own ads. Combining the talent of his predecessors with his own sense of futurism, Dossena is moving forward the conversation that had once so inspired him as a young boy. “There are a lot of fans, yes,” Saville explains of Dossena’s clear warmth and admiration for him. “There’s a nice reason for it. It’s the ‘art of the playground’, which is Tony Wilson’s expression. I resented it at the time because of the word ‘playground’ but now I’m older I appreciate the extraordinary influence of it: of unusual interesting things, new, novel, introductory things, going to young people at a very formative time in their lives. 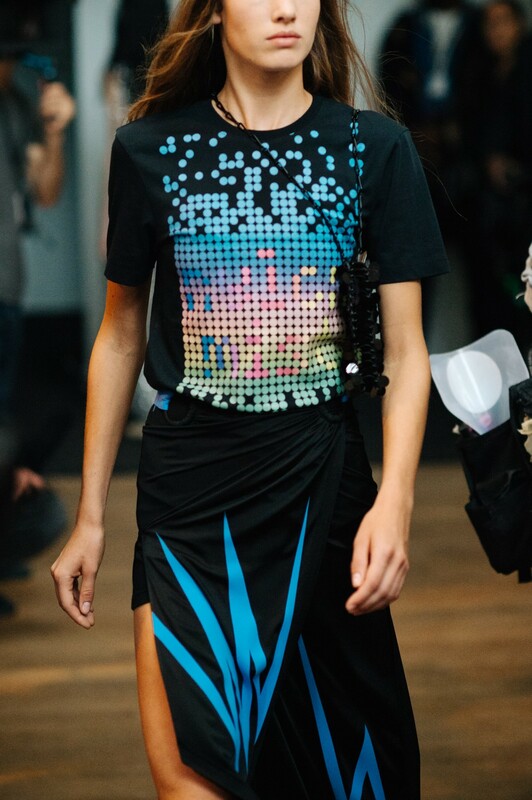 But also commonly across all walks of life, maybe influencing someone who might become a van driver or a clothes designer.” The result of these fluid influences is a second series of seductive, slinky T-shirts which melds succinctly with the themes of the collection. 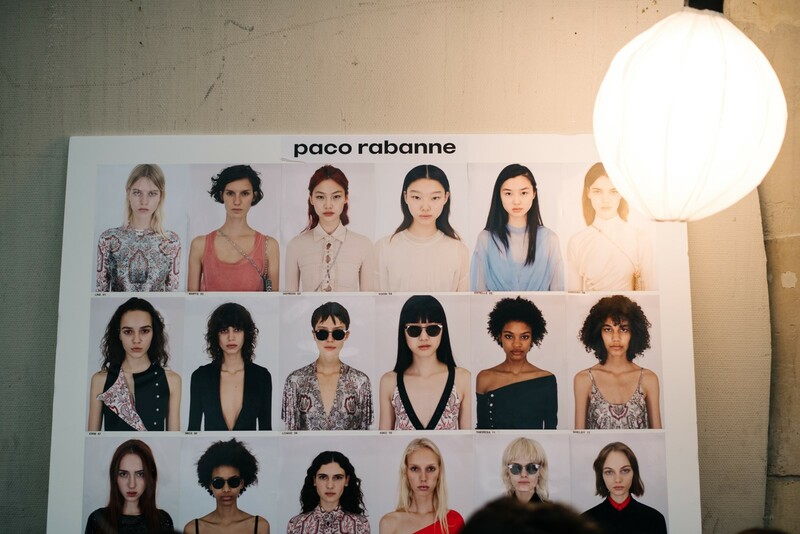 Though there are nods to teenage obsessions – Factory Records, the dark world of digital, casualwear – they were of course embedded in Paco Rabanne’s trademark glamour, with Dossena harking back to another factory, that of Andy Warhol’s New York party scene. The sinuous silhouette of his now trademark reinvigorated chainmail was decorated with a careful paisley pattern that came from the kitsch battered sofas in Warhol’s warehouse studio. 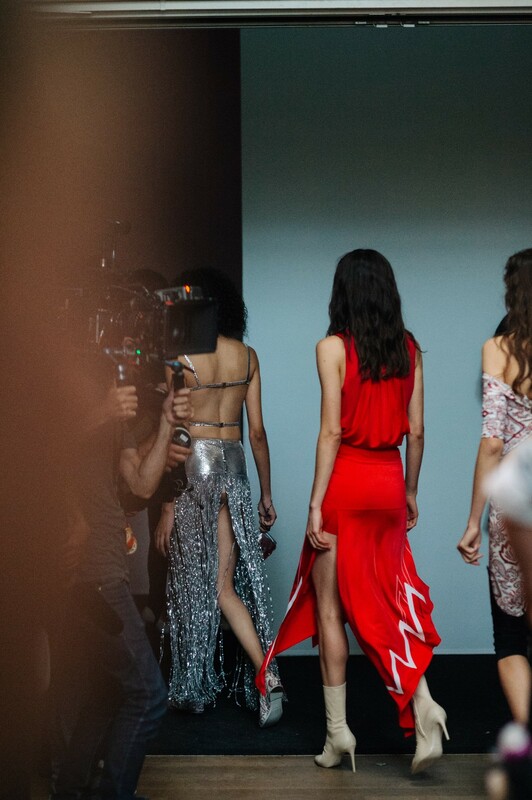 These slightly fusty old patterns would be mixed with the glittering gowns of the artist’s guests – a mix of grime and glamour that seems to fuel each of the creative director’s collections. “I love to take pop culture and clean it,” Dossena explains. “To take the message but in a super direct way. It’s all about the direct expression of pop culture: a direct sense or perception.” With his careful attention to the power of cultural codes, it makes sense that he fits so well with taste-makers like Ascoli and Saville.